2018 is set to become a hallmark for two nations in World of Tanks. You’ve read about Italian tanks rolling into battle — currently in Common Test and arriving next update — so now it’s time to shift the spotlight to the newcomers from Central Europe. Here’s an overview of the Polish nation’s tanks and their peculiarities, including a tentative roster and features of the first Premium Polish tank designed in that country. The Polish line will include 10 machines of various classes. To bring you up to speed, we kick-off with light tanks, pass through a set of mediums, then move on to bigger things with heavies. Why Poland? First, the country’s historic role. Poland turned out to be in the center of two World Wars, and we can’t ignore the bravery, prowess, and contribution of its people during these conflicts. Second, the Polish community is one of the largest in the game, and we want to pay tribute to these devoted and passionate tankers. We've already dabbled in Polish tank history. A German Panther Ausf. G, captured by Polish forces during the 1944 Warsaw uprising was dubbed the Pudel ("poodle"), adorned with special markings, and used in urban skirmishes. The tank entered World of Tanks in August 2017, as a Tier VI medium. As Poland wasn’t that focused on building their own tank fleet, the country’s main arsenal was made up of foreign machines. The first tanks that came into service of the Polish army right after WWI were the compact and extremely effective Renault FTs from France. Those were later joined by British vehicles, while tanks designed in Poland borrowed greatly from successful designs from German, Soviet, and American machines. In short, the majority of “original” Polish tanks were heavily inspired by or almost complete copies of tanks from neighboring countries. Introducing these machines would strip any identity and defining features from the entire Tech Tree. We decided to go one step further. Our historians went to the mid-20th century archives to dig up information on any original and unorthodox Polish designs. Be it a pre-production prototype or a graduate’s thesis project, we researched authentic projects crafted by native Polish constructors. Just like the Italians, the Poles were playing catch up. The country’s tank-building history falls into three stages: the pre-war stage with various prototypes under development; the experimental stage, where engineers started to base their ideas on real combat experience; and the post-war stage with designs borrowing much from successful production models created by the dominant tank-building nations. Stage I: Tiers I to IV are early light tanks that represent the formative years in Polish tank building. 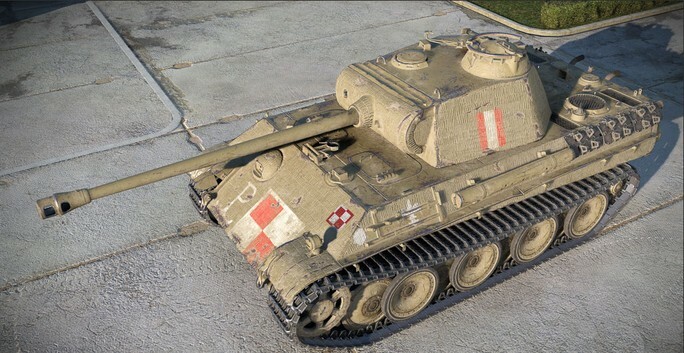 Inspired by the British Vickers Carden Loyd commercial light tank and Vickers Mk.E, the Polish machines received additional improvements and started their life with the 4TP light tank, which proudly takes the Tier I spot in the line. Lightly armored, nimble, and equipped with an automatic gun, this anti-personnel tank set the tone for the whole line of the Polish lights. Stage II: Tier V starts the line of medium tanks with a transitional model that combines traits of both classes. Tiers VI and VII are represented by purely experimental models heavily influenced by German and Soviet machines. This is where the first examples of sloped armor and coil-spring suspensions were tested. Stage III: The real-life post-war heavy tanks operated by Polish armed forces were nothing but slightly modified Soviet machines. So, we went to the archives looking for references. We came across three thesis projects by graduate engineers, and these ideas will be embodied in the game at Tiers VIII, IX, and X. They are compact and highly dynamic heavies with original weapons, boasting a solid balance between alpha damage and firing rate. A Premium Tank — the Project 51 raw prototype from the early 1950s — will precede the nation’s release. It will be a traditionally shaped Tier VIII heavy with good frontal armor (you’ll be thankful for the armor on the turret and upper plate), an impressive alpha of 440 points, and -8 degrees of gun depression, which means it can be effective on uneven terrain. The tank will mostly benefit from mid- and close-range combat, tearing through defenses with authority. The possible competitors? You’ll hardly find any straight comparison, so the tank has all the chances to become a bright addition to the game. This is the first batch of information we’re glad to share with you on the second of two upcoming nations in World of Tanks. While we’ve not revealed too much just yet, you can be sure the line will include unconventional vehicles that provide an original combat experience. More articles are on the way as we keep designing and tweaking the Polish line, so stay tuned!